Before college started, I spent an evening playing games with Aidan, my son. We first ate dinner, then worked through some college planning. First we played a few games of Mouseguard: Swords & Strongholds. The rules are simple, but the strategy fails me. 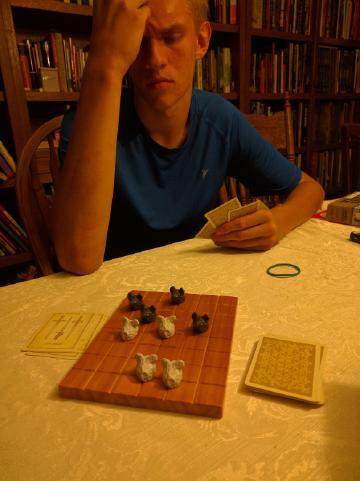 I have played 6 or 7 games against my son, and never won. This evening was no different. Our last game was a rather protracted game as we each jockeyed for position. Even when I had what I thought to an advantage (see the above picture) things collapsed and Aidan won. After losing, we pulled out another of our standards - Wyatt Earp; We’ve played this game together since 2005 or so. I’d wager that I have a 80+% winning streak versus Aidan. And my luck held. Two tense games, and I knocked another two victories in the proverbial belt. It was our only evening together throughout the summer. And I cherished each moment…in agonizing defeat and glorious victory. We laughed as we talked through college stuff, gaming, how his first year of college went, and general life things. It is very rewarding listening to Aidan’s thoughtful consideration as he works through the complexities of college decisions. I can’t help but smile and beam with pride when he calls up and asks for help and advice. Game Night with my Son by Jeremy Friesen is licensed under a Creative Commons Attribution-NonCommercial-NoDerivatives 4.0 International License. Based on a work at https://takeonrules.com/2016/09/07/game-night-with-my-son/. Permissions beyond the scope of this license may be available at https://takeonrules.com/more_permissions/.